Capacity 250gm, 500gm & 1000gm. Our Twin collar type form fill & seal machine with servo driven auger is suitable to pack sticky & non sticky powders like milk powder, detergent powder, flour, spices, custart powder, oats powder & glucose powder etc. Speed: Upto 50gm Approx. 180 pouches per minute, upto 250gm: Approx. 100 pouches per minute, upto 1000gm: Approx. 60 pouches per minute, Upto 2000gm: Approx. 35 pouches per minute. 02 Nos. Servo operated auger Filler. Through Servo motor (02 Nos.) (1 KW, Schneider/ Delta make). Any continuous heat seal able laminated film in roll form. By clap type sealing jaws (pneumatically operated). Microprocessor controlled MMI with PLC (Siemens/ Delta/ Schneider Make). 5.7’’ Touch screen, color (Siemens/ Delta/ Schneider make). Yes. Pneumatic type brake system. 02 Nos. 1 HP (ABB / BCH). 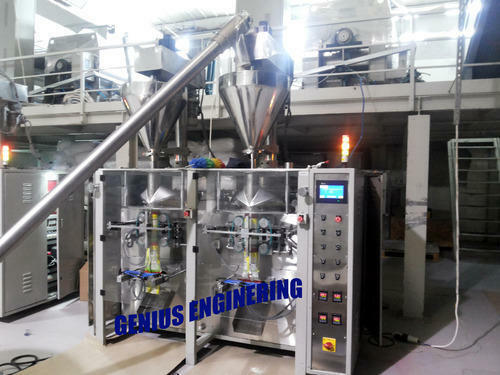 We, “Genius Engineering”, established in the year 2008, are leading manufacturer, exporter & supplier of Packaging & Filling Machine such as Packaging Machine, Pouch Filling Machine, Zipper Pouch Packing Machine, Auger Filler Pouch Packing Machine, etc. We are also offering Packaging Machine Repairing Services, Spare Part Services and AMC Services. Our Exporting Countries are USA, Nigeria, Uganda, Sri Lanka, South Africa, Bangladesh, Nepal, bhutan, Malaysia, Australia, Dominican Republic, Saudi Arabia and Gulf Countries. These machines are extensively used in various industries owing to their high quality standards and reliable for packaging all kinds of pouches which are used as retail and transports packages. Additionally, clients can avail the entire range of Form filling & sealing Machine at reasonable price. We are committed to provide world class packaging machines at highly economical prices.